The 1st Assiniboia Scouts are a small group located in southern Saskatchewan along the migration path of the Monarch Butterfly. 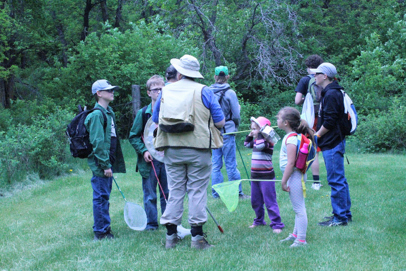 Because Scouting adventures are best shared with friends, for the past several years, with the vision of Scouter Randy Gaveronski, we have planned and hosted a two-night butterfly camp in the spring with Troops from the Great Plains Area. 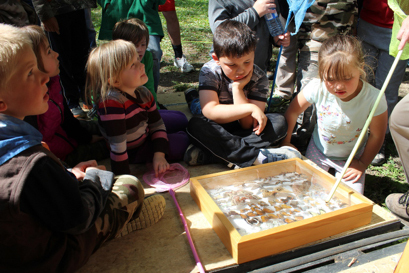 This camp gives youth of all ages and geographical locations a chance to learn about the life cycle of butterflies/moths and the environment in which they live in. Camp plans begin with the youth planning meals, making grocery lists and assisting with purchasing groceries, packing the food, and checking equipment for the weekend. The Venturers and Scouts help review gear lists with the younger Beavers and Cubs. This leadership is encouraged and continues throughout the weekend. Our favorite part of the weekend is when local butterfly/moth enthusiast Dan joins us. After dark, we set out for our night hike to locate the traps that Dan has set up earlier in the evening. The traps reveal several species of moths. The following morning, while we wait for the heat of the morning sun too dry off the butterfly wings, Dan identifies the species of moths caught in the traps overnight. He also shares his extensive personal butterfly collection. He reviews what species of butterflies are found in the region and the vegetation they rely on. On our day hike, Dan shows the group how to find butterfly eggs and he helps us identify the plants that butterflies rely on to survive. Over the course of the weekend, we identify up to 19 different species of butterflies. We are even fortunate to catch and release a couple of Monarchs. Our hiking destination is the St. Victor Petroglyphs. The petroglyphs were carved between 500-1700 A.D. these carvings are unique, in that they are the only petroglyphs carved upon a horizontal surface on the Canadian Plains. The youth learn about the history of the petroglyphs and the importance of respecting and protecting this and other historical sites. The afternoon winds down with a craft project and a fire lighting demonstration with flint and steel by a Venturer. Each youth then explores the environment to locate fire lighting material to light their own fires and successfully cook their supper meal. On the final morning with the help of all the youth, we pack up camp and the area is checked to ensure that we “Leave No Trace”. During the trip home we review the weekend by sharing stories of what the youth enjoyed. What they would like to try again and what they would like to do for our next camp. Before we arrive home, they have already planned their next great Scouting adventure.